Gibson Dunn | Sagayam, Selina S.
Selina Sagayam is the Head of UK Transactional Practice Development in the London office of Gibson, Dunn & Crutcher. She is an English qualified lawyer who joined the firm as a partner in 2007. In her practice development role, Ms. Sagayam is responsible for the Knowledge and Practice Management and functions of the firm’s English law Transactional Practice. She is a member of the firm’s international Mergers and Acquisitions, Hostile M&A and Shareholder Activism, Capital Markets and Securities Regulation and Corporate Governance Practice Groups. 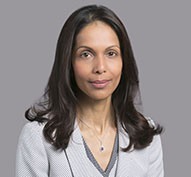 As an English qualified lawyer, Ms. Sagayam’s practice focused on international corporate finance transactional work, including public and private M&A, joint ventures, international equity capital markets offerings and advisory work focused on corporate governance, shareholder activism and securities law advice. She is also noted for her expertise in financial services and regulatory advice and has advised boards and senior management of international corporations, exchanges, regulators, investment banks, and financial sponsors (private equity and hedge funds) on such issues. Ms. Sagayam is regarded as one of the leading public M&A advisers in the UK and has advised on hostile, competitive and recommended takeovers. She has extensive experience in the City Code governing public takeovers in the UK and the European Takeovers Directive. She was seconded for two years to the Panel on Takeovers and Mergers, the key regulatory body governing public company acquisitions in the UK, and is now regularly called upon as key adviser and commentator on UK and European takeovers. She is a regular speaker at conferences in the UK and Europe on takeovers and cross-border M&A, has authored numerous articles on corporate finance and corporate governance issues, is also regularly quoted and appeared in the financial press and media for her views on M&A transactions. In her new role as Head of UK Transactional Practice Development, Ms. Sagayam will use her expertise as a corporate partner to brand and position Gibson Dunn’s growing English law transactional practice in the marketplace. Ms. Sagayam is a member of Gibson Dunn’s Global Diversity Committee and chairs its London Diversity Committee. She is also a member of the board of the Corporate Finance Faculty of the ICAEW (Institute of Chartered Accountants in England & Wales), the Advisory Board of Diversity UK and the Consulting Editorial Board of LexisPSL Corporate. Ms. Sagayam is also a member of the Learning Council of the Serpentine Gallery, a Charter & Founder Member of the TiE UK and a member of The Honourable Society of Gray’s Inn. Client Alert - November 9, 2016 | UK Public M&A – When Is a “Final Offer” Not Final? Client Alert - June 22, 2016 | New European Market Abuse Regime – What Do Non-EU Incorporated Issuers Need to Know? Client Alert - January 21, 2015 | Recent UK Takeover Rule Changes: To Undertake or Intend — Mind the Difference! Client Alert - December 6, 2011 | The Enforcement Regime of the UK Financial Services Authority — Who’s Next? Client Alert - September 30, 2009 | Remuneration Reform: G20 – Breakthrough?